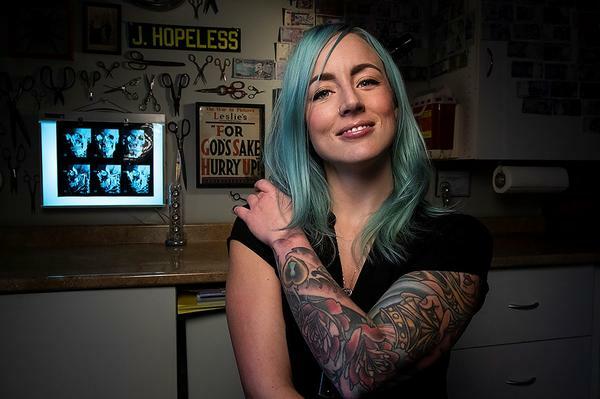 Tattoo artist Jessie Hopeless, at Exile Tattoo on 39th Street, has a three-month waiting list. Once the bane of parents and bosses, tattoos are now everywhere. Four out of every 10 people born after 1980 have at least one tattoo, according to the Pew Research Center. When Brennan O’Rourke bought A1 Tattoo Shop in Gladstone twenty years ago, the scene looked a lot different. O’Rourke is in the middle of three generations of artists who told KCUR how the city’s tattoo renaissance happened. Grimm Tattoo at 39th and Broadway is like a museum. The walls are covered in antique tattoo designs, some of which date back to before World War I. Although Grimm Tattoo has only existed as a brick and mortar shop since 1980, the Grimm name has been around for more than 100 years. Wes Grimm owns the shop, which has been in its current location for six years after moving from 38th and Main Streets. "Great Grandpa chose the name because his father and his uncle didn't want him using a family name to tattoo at 16, so he chose the name Grimm and he worked his whole life under that name, and I still carry the name today professionally," says Grimm (who would not reveal his legal name). Grimm's history makes him a veteran of the Kansas City tattoo scene. When the shop first opened, he was one of only seven artists working in the area. "Great Grandpa was still working, and they worked mostly on sailors. And my grandfather lived here in the Midwest. He worked mostly on bikers." O’Rourke got his first tattoo when he was 16, and now he has dozens — some of them inked by Wes Grimm. "A lot of the younger people, their parents are already tattooed so they grow up seeing tattoos on their parents," says O'Rourke. "There's not a stigma to it like it used to be." O'Rourke cut his teeth in Kansas City with other punk-rock kids eager to learn the art of tattooing. "All of us were getting tattooed, and then a lot of us were creative people and we started finding bikers that would teach us to tattoo, so we were like the next generation after bikers," says O’Rourke, now in his late 40s. "That's how it is almost everywhere in America, the same type of thing. Anyone that's my age, a lot of them are from punk rock." Jessie Hopeless (legally Jessie Hallum) is known for photorealistic tattoos that span huge portions of her clients' bodies. She's worked at Exile Tattoo near 39th and State Line for ten years and has a waitlist starting at three months. Hopeless says she enjoys her artistic freedom. "Fifteen years ago when you walked into a tattoo studio, there was a bunch of art on the wall and you kind of chose from that selection. Even a few years ago, I feel like people were mostly using Google or Pinterest," Hopeless says. Today, she says, "people are more open to having something drawn for them and coming in with a loose idea and letting someone really run with it, which is great for me because that's exactly what I wanted to do." Although new shops are appearing all the time, Hopeless says she isn't threatened by the competition. The more, the merrier. "You see a new shop pop up and it's like, 'Oh my gosh, there are these talented people that work right down the street from me that I just met.' I don't think anybody in my industry feels like it's especially threatening or problematic, just that we're very fortunate that there is so much love for tattoos in Kansas City, that so many businesses can be successful." Clearly, there's plenty of demand in Kansas City — and not only from bikers and sailors. "Even (among) people with professional jobs," Hopeless says. "We tattoo surgeons and CEOs and preachers, so nothing's off the table anymore." Courtney Bierman was a KCUR intern in summer 2018. Follow her on Twitter @courtbierman.